Industry Integration — Pro-vision Reef Inc.
Stewardship Action Plan 2013: Mitigating Ecological Risk in a Changing Climate establishes standards to be implemented by industry that will mitigate fishery risks that are identified through the Ecological Risk Assessment. The standards include modified collection practices in the water, committing to partnerships with research bodies to fill knowledge gaps, trial and adoption of new technology for species level fishery data delivered in real time, and providing the fishery and protected areas managers with digital imagery in a format that is beneficial for resource assessment. The industry has taken these steps to strengthen the environmental performance of the fishery and its management prior to the subsequent Fishery Assessment and the provision of sufficient information to enable a CITES Non-detriment Finding. Stewardship Action Plan 2013: Mitigating Ecological Risk in a Changing Climate responds to the Ecological Risk Assessment with industry standards that manifest in the water. These standards aim to mitigate identified risks and complement, in a highly targeted manner, the Fishery Management Arrangements devised by Fisheries Queensland. 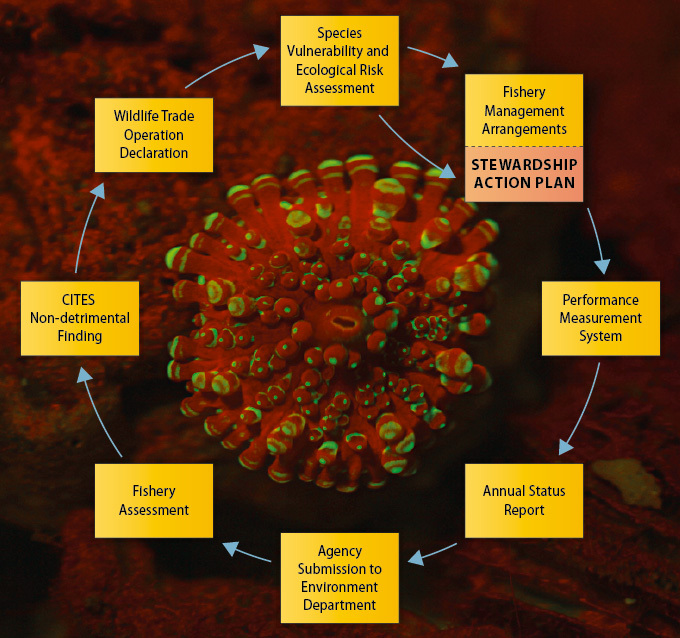 It is at this early stage of the cycle of assessment, management and monitoring that the industry standards are introduced to drive down ecological risk within the fishery so that there is a practical industry contribution to an ongoing finding of ‘non-detriment’ in the CITES assessments and ongoing approval for export eligibility.